The problem of homochirality in biology does not have prominence in ID literature because it is unglamorous and there is hesitation to endorse homochirality as evidence of design because of the fear there will be some future discovery in chemistry that will over turn it. But the sword of uncertainty cuts both ways, and if uncertainty casts doubt on ID, it casts even more doubt on mindless evolutionism. Right now the problem of homochirality is firmly an argument in favor of ID, and future discoveries could favor the ID case even more not less, so let us not be too quick to de-emphasize the homochirality argument. Living organisms are notoriously 100% left-handed for amino acids and 100% right-handed for DNAs and sugars (thus living organisms are said to be homochiral). If we apply enough heat to a chiral molecule, it will flip spontaneously from one form to another, just like a coin will flip sides if we apply enough agitation to it. 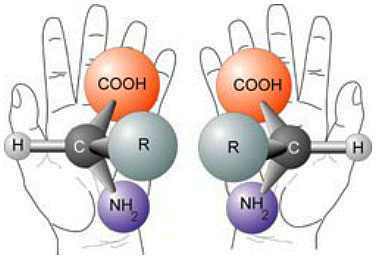 Even at room temperature, given enough time and chance, the left-handed amino acid will become right-handed. Living organisms have huge amounts of built-in cellular machinery to generate and maintain homochirality. When something dies, the amino acids will slowly racemize into mixtures of 50% left and right-handed forms, and that is under the generous assumption the dead organism doesn’t undergo other forms of chemical decay such as hydrolysis, deanimation, depurination, etc. etc. Every experiment trying to synthesize the pre-cursors of life via some “plausible” pre-biotic chemical soup (like Urey-Miller), creates heterochiral mixtures of molecules (50% left, 50% right handed). We are conditioned to think that chemistry will drive the organization of atoms to one particular configuration, but the opposite is true of chiral molecules. The natural evolution of chiral molecules is to go toward a 50/50 mix of left and right handed forms like fair coins will tend to go to a 50/50 mix of heads and tails. IDists were quick to seize on the fact that left-hand and right-handed forms can be treated like symbols. The organization of the symbols into recognizable patterns cannot be due to chance or chemical processes in a pre-biotic soup. In fact, chemical principles will work against symbolic organization into homochirality just like chance process will work against symbolic organization of a set of fair coins to 100% heads. The statistical arguments that were offered at UD for fair coins applies to chiral molecules. Could that be why Nick Matzke didn’t want to give one millimeter of ground on the question of 500 fair coins heads, because deep down, he knew the question was extensible to biology? Can material/mechanistic processes be a solution to the problem of homochirality? Yes and no. “Yes” in the sense a nano-molecular material machine (a cell) can make homochiral materials, but “no” in the sense that such complex machines can’t self assemble from a pre-biotic soup where chance is the only mechanism available to build such a machine. Why? Homochirality is essential for life. Proteins will not fold properly and likely DNA cannot be read realiably without homochirality. It is the classic chicken and egg paradox. Did life emerge first or did homochirality emerge first? Some might argue the first life was not homochiral. Well, the problem is this: suppose the first life was heterochiral, how can you guarantee stable protein folding and reliable reading of DNA for the next generation of creatures when the state of the components is unstable. This is almost as bad as suggesting binary data of a working piece of software could be have all the bits randomly flipped and you’d end up with another piece of working software. If heterochiral life emerged, it would quickly self destruct in the next generation. Chemists have tried in vain to find ways to make pre-biotic soups homochiral, but like starting out with all fair coins heads, it won’t take too much to destroy the symbolic organization even if the system started out organized. Individual amino acids molecules (monomers) in a pre-biotic soup need a means of assembling into long chains of molecules (polymers). This cannot be done without energy. It is like welding things together (so to speak). Now using undirected energy, Sidney Fox took homochiral amino acids monomers from soy beans (because he couldn’t find such nice homochiral materials from a pre-biotic synthesis experiment 🙂 ), and then tried to weld them together to form primitive proteins by heating the acids to 200°C for several hours. No matter that we would consider 200°C a temperature more conducive to sterilization (aka killing biological organisms), but in the process of welding the L-amino acids into polymers, many of the L-amino acids became D-amino acids. Homochirality is an unglamourous form of symbolic organization, but because of its simplicity I like using it to illustrate ID concepts. The symbolic organization of homochirality is also critical to the functionality of life. I’m going bit out on a limb in that the argument could be falsified by some future discovery in chemistry, but isn’t that what science is about? Making falsifiable claims? In any case, I’d rather be on the ID side of the wager than the other side given what is known. I do not worry so much about some chemist finding a way to make a homochiral pre-biotic soup (yes that would mean a soup of 100% left-handed amino acids, 100% right handed DNAs, and 100% right-handed sugars :roll:). Because even supposing there were some means to start off with a homochiral pre-biotic soup, it cannot stay that way for long and the homochirality will be lost if polymerization takes place using undirected energy. Though I’ve laid out some technical details as to why life will not arise from dead chemicals, we know this instinctively. A dead dog is far richer in plausible pre-biotic materials than can ever be synthesized in any OOL lab. But a dead dog will stay a dead dog. 1. photo credits : Vanderbilt. 2. There are a few bacteria that like high temperatures. Thermophillic bacteria live at 122°C, but even Fox’s polymerization method would have killed those bacteria. Further, when temperatures are so high or conditions so amenable to random polymerization that free-floating amino acids spontaneously bond to a polymerized chain, that would be lethal also to life. 3. Homochirality in amino acids is only tip of the iceberg in terms of simple symbolic organization of that variety. To that we must add that all the peptide links to form a proptein must be alpha-peptide bonds, not some mix of alpha and epsilon,beta, and gamma bonds (such as happened with Sidney Fox’s experiment above). 4. And what about DNA polymers? When DNA is randomly polymerized in pre-biotic type experiments, you end up get a mix dominated by 2′-5′ over 3′-5′ links, whereas for DNA to be readable it has to be uniformly 3′-5′. Without the homogeneity of homochirality, identical kinds of links, etc., even if life could have miraculously formed without all this, it would quickly self destruct for the next generation. 5. A general rule seems to emerge. Trying to solve one problem for OOL (like amino acid polymerization via heat) create other problems (like creating lethal temperatures and racemizing the amino acids). Pre-biotic soups would be considered toxic. Darwin’s “warm little pond” was not the origin of life but rather a cesspool of death. Predictions, predictions: What will the genome sequence of a million-year-old hominin show? To clairify, when dealing with fair coins the we use a 50/50 distribution to reject 100% heads. In the cases listed above, the weighting is even worse — it’s like saying we want 100% heads when the bias is 80% toward tails (such as in the case of 2′-5′ links and the over dominance of non-alpha peptide bonds). Coin analogies run deep in biology! In a world ruled by reason this would not be controversial in the least. homochirality is obviously not due to chance. It therefore demands an explanation. Because of the way our brains are hardwired humans will infer design until a viable alternative explanation for homochirality is offered. Since we don’t live in a world ruled by reason expect lots of comments trying to deny what is patently obvious for fear that to do otherwise will somehow cause the public schools to teach that the earth is flat. Homochirality is essential for life. Proteins will not fold properly and likely DNA cannot be read realiably without homochirality. It is the classic chicken and egg paradox. Did life emerge first or did homochirality emerge first? Some might argue the first life was not homochiral. Well, the problem is this: suppose the first life was heterochiral, how can you guarantee stable protein folding and reliable reading of DNA for the next generation of creatures when the state of the components is unstable. It would seem that without homochirality (either left or right), lengthy molecules would not be folded compactly and consistently. They would be strung out and exposed to damage or their unweildy lengths would preclude reliable, efficient reproduction. Further, the physical dimensions of living organisms (complex living organisms) would likely be too large to survive (their metabolic requirements incompatible with the known strength of gravity and density/composition of atmosphere, etc.) if the nucleus of a cell was 1.5 to 3 meters in diameter just to accommodate unfolded DNA, and cellular machinery commensurately larger, organs and bodies commensurately larger still. Homochirality seems another aspect of fine tuning. But a dead dog will stay a dead dog. Is this weekend the first time you’ve commented at UD? Usually what happens is that your comment will be trapped in the moderation queue until they get you on the list of approve participants. I don’t know why your comments keep getting held up. NOTE to Mods: I’ll vouch for fithmonarchyman. No I comment from time to time. I don’t think I’m regular enough to get the on the elite “approved participants” list. It’s really ok when my comments appear instantly I’m tempted to get back into the back and forth. You know what they say about doing the same thing over and over and expecting different results. Sorry to be commenting so late. But this thread was linked and I read it, and it contains an error that should be corrected. When DNA is randomly polymerized in pre-biotic type experiments, you end up get a mix dominated by 2?-5? over 3?-5? links, whereas for DNA to be readable it has to be uniformly 3?-5?. That is, unfortunately incorrect. DNA happens to have the sugar 2-deoxyribose, and so cannot make 2?-5? linkages. It can only make 2?-5? (or 2?-2? or 5?-5?) linkages. It hardly qualifies as a demonstration of early-earth production of RNA as there are too many special circumstances that have to be invoked (see the comment), but it is wise not to get too dogmatic about the impossibility of making 3?-5? linkages by quasi-random means.